Below are some commonly asked questions that we have supplied answers to. Do we deliver only supply locally? Do you have store/outlet in a specific province? 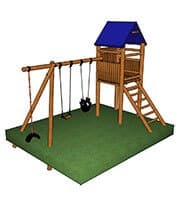 No, we have priced all our items delivered and our Accredited Kidbuddie installers are available to install our jungle gyms. Why is Kidbuddie more expensive than the other Jungle Gym suppliers? Kidbuddie was established in 1993, its been tested and only the very best quality timber and workmanship is supplied. Our timber is H4 CCA treated and pre-drilled for assembly and not overlapped. Do we have DIY kit jungle Gyms? Yes our jungle gyms can be installed oneself, instructions are given for all orders. We carry stock of all of our accessories, swings and Pony Rockers. Why does timber crack and does it affect the strength of the timber? Timber is a natural product with moisture. Its exposed to different levels of humidity and will “check”. To reduce “checking” to a minimal, apply timber preservative at least twice a year. This does not affect the strength of the timber, it remains SABS approved.